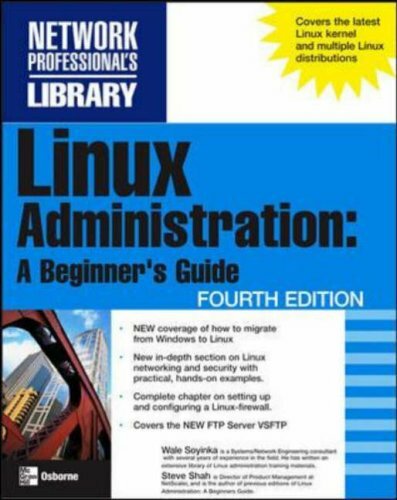 With coverage of the most recent Linux kernel and multiple Linux platforms including Red Hat Linux Fedora 4, SuSe Linux, Red Hat Enterprise Linux, and others, this updated instructional system is designed to show even the most novice user the keys to successful administration. Readers will learn to install and configure Linux, manage files and software, grant user rights, implement security at the kernel level, and more. Death and the King's Horsemen, From Zia with Love, The Beatification of Area Boy, and King Baabu. His collections of poetry include Idanre and Other Poems, A Shuttle in the Crypt, and Mandela's Earth and Other Poems. His novels include The Interpreters, which won the 1968 Jock Campbell Literary Award, and Season of Anomy. His autobiographical works include Ake: The Years of Childhood, Isara: A Voyage Around Essay, The Open Sore of a Continent: A Personal Memoir of the Nigerian Crisis, and You Must Set Forth at Dawn. His literary essays collections include Myth, Literature and the African World and Art, Dialogue and Outrage. During the civil war in Nigeria, he appealed for cease-fire in an article. Accused of treason, he was held in solitary confinement for 22 months. Two of his works, The Man Died: Prison Notes of Wole Soyinka and Poems from Prison, were secretly written on toilet paper and smuggled out of prison. He won the Nobel Prize for Literature in 1986.